A supermarket is a departmentalized self-service retail store offering a wide variety of food products, such as meat, produce, dairy, and so forth, along with various household merchandise. It is larger in size and has a wider selection than a traditional grocery store. Supermarkets are generally situated near residential areas for easy access and maximum sales. While supermarkets offer convenience and variety to consumers, they have attracted significant criticism. As with so many advances, both technological and social, self-centered greed on the part of those in authority causes problems. For the supermarket to be beneficial to society, those owning and managing the stores must take responsibility to serve the whole purpose, social and environmental. The supermarket typically comprises meat, produce, dairy, and baked goods departments along with shelf space reserved for canned and packaged goods. A variety of non-food items such as household cleaners, pharmacy products, and pet supplies are also available. Most supermarkets also sell a variety of other household products that are consumed regularly, such as alcohol (where permitted), household cleaning products, medicine, clothes, and some sell a much wider range of non-food products. The traditional supermarket occupies a large floor space on a single level and is situated near a residential area in order to be convenient to consumers. Its basic appeal is the availability of a broad selection of goods under a single roof at relatively low prices. Other advantages include ease of parking and, frequently, the convenience of shopping hours that extend far into the evening. Supermarkets usually make massive outlays for newspaper and other advertising and often present elaborate in-store displays of products. Supermarkets are often part of a chain that owns or controls (sometimes by franchise) other supermarkets located in the same or other towns; this increases the opportunities for economies of scale. Most supermarkets are similar in design and layout due to trends in marketing. Produce tends to be near the entrance of the store. Milk, bread, and other essential items may be located in the rear or other out of the way places. This is purposely done to ensure maximum time spent in the store, strolling past other items and capitalizing on impulse buying. The front of the store is where one finds point of sale machines or cash registers. Many retailers have implemented self-checkout devices in their stores in an attempt to reduce labor costs. A group of four or five self-checkoutg machines can be supervised by a single assistant. 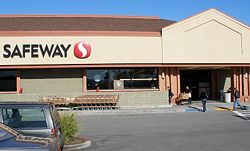 In North America, supermarket chains are often supplied from the distribution centers of a larger business, such as Loblaw Companies in Canada, which owns thousands of supermarkets across the nation. They have a distribution center in every province—usually in the largest city in the province. Supermarkets usually offer products at low prices by reducing margins. Certain products (typically staples such as bread, milk, and sugar) are often sold as loss leaders, that is, with negative margins. To maintain a profit, supermarkets attempt to make up for the low margins with a high overall volume of sales, and with sales of higher-margin items. Customers usually shop by putting their products into shopping carts (trolleys) or baskets (self-service) and pay for the products at the check-out. A larger full-service supermarket may be combined with a department store and is sometimes known as a "hypermarket." Other services that supermarkets may have include banks, cafés, day care, photo development, video rental, pharmacies, and gas stations. In the early days of retailing, all products had to be fetched by an assistant from shelves on one side of a counter while the customers stood on the other side and pointed to what they wanted. Also, many foods did not come in the individually wrapped consumer-size packages taken for granted today, so an assistant had to measure out the precise amount desired by the consumer. These practices were obviously labor-intensive and therefore quite expensive. The shopping process was slow, as the number of clerks employed in the store limited the number of customers who could be attended at one time. The concept of a self-service grocery store was developed by Clarence Saunders and his Piggly Wiggly stores. His first store opened in Memphis, Tennessee in 1916. Saunders was awarded several patents for the ideas he incorporated into the Piggly Wiggly stores. The stores were a financial success and Saunders began to offer franchises. A&P was another successful early chain in Canada and the United States, having become common in North American cities in the 1920s. The general trend in retail since then has been to stack shelves at night and let the customers get their own goods and bring them to the front of the store to pay for them. Although there is a higher risk of shoplifting, the costs of appropriate security measures will be ideally outweighed by the economies of scale and reduced labor costs. According to the Smithsonian Institution, the first true supermarket in the United States, and the world, was opened by ex-Kroger employee Michael J. Cullen, on August 4, 1930, in a 6,000 square foot (560 m²) former garage in Jamaica, Queens, New York. The store, King Kullen, named for King Kong, operated under the slogan "Pile it high. Sell it low." The main difference between this store and the Piggly Wiggly stores was that Cullen's store was much larger, and they stocked national brands of food that were not easily found at neighborhood markets. The rise of the refrigerator also gave Cullen the idea to install a parking lot near the supermarket so people could buy large quantities of food for storage. When Cullen died in 1936, there were 17 stores in operation. Existing grocery chains like Kroger and Safeway at first resisted Cullen's idea, but eventually were forced to build their own supermarkets as the North American economy sank further into the Great Depression and consumers became price-sensitive to a degree never seen before. Kroger took the idea one step farther and pioneered the first supermarket surrounded on all four sides by a parking lot. Soon, other supermarkets popped up, using the ideas that Cullen had originated to attract many consumers. Supermarkets proliferated in Canada and the United States after World War II. Throughout the 1950s, supermarkets spread into Europe. The rest of the world accepted supermarkets throughout the 1960s, 1970s, and 1980s, with some parts of Asia accusing the major supermarket chains of promoting westernization. Supermarkets rose to prominence in Africa in the 1990s, spreading rapidly through eastern and southern Africa. North American supermarkets are often co-located with smaller retailers in strip malls and are generally regional rather than national. Kroger is probably the closest thing to a national chain in the United States but has preserved most of its regional brands like Ralphs, City Market, and King Soopers. In Canada, the largest food retailer is Loblaw Companies. 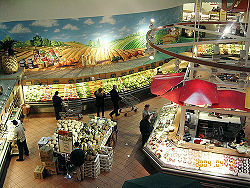 Loblaw Companies operates grocery stores across Canada under a variety of regional names such as Fortinos, Zehrs, and the largest Loblaws (named after the company itself). Sobeys is Canada's second largest supermarket with locations across the country, operating under many banners (Sobeys, IGA in Quebec locations). In the United Kingdom, Tesco is the largest chain of supermarkets followed by ASDA and Sainsbury's. In many parts of the world, the proliferation of out-of-town supermarkets has been blamed for the disappearance of smaller, local grocery stores and for increased dependency on the automobile (and the consequent traffic). In particular, some critics consider the practice of selling loss leaders to be anti-competitive, and are also wary of the negotiating power large retailers have with suppliers. Supermarkets own much of the food retail in many countries. In the United States, 70 percent of the food retail is controlled by supermarkets. The figure is similar in Europe. The rise of supermarkets in Asia, South America, and Africa places supermarkets in control of about 55 percent of all food retail in the regions. It was formerly common for supermarkets to give trading stamps. Today, most supermarkets issue store-specific "members cards," "club cards," or "loyalty cards" which are scanned at the register when the customer goes to checkout. Typically, several items are given special discounts if the credit card-like devices are used. Today supermarkets face price competition from discount retailers such as Wal-Mart and Zellers (non-union labor and greater buying power) and warehouse stores such as Costco (savings in bulk quantities). Bells Stores, serving northeast England. Kroger, serving the southern United States. Pick 'n Pay, serving South Africa. Super Fresh, serving the northeast United States. 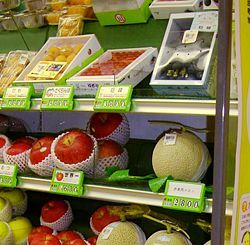 Fruit on display in a supermarket in Japan. Some countries expand their supermarkets to include products that are not related to food and necessary items, such as music CDs, movies, and clothing. This Flagship Randalls store in Houston, Texas is an example of an upscale supermarket. Supermarkets are criticized for being not being environmentally supportive. Many supermarkets have initiated new environmental protection policies and switched to organic options for food choices, but some of these changes are deceptive. The new environmental policies are hand in hand with the same problems that supermarkets have always had. Changes are a step in the right direction, but the supermarkets still create pollution. The organic food that many markets provide are not from independent farms, as many supermarkets would have customers believe, but rather come from farms owned by transnational corporations. Many supermarkets have started stealing methods of organic farming to sell their produce, while shutting out organic farmers from doing business with them in order to maximize profit. It is suggested that supermarkets create a skewed perspective on the development and production of food. Surveys have shown that people are less informed on where their produce comes from, and are unable to identify how certain foods are made, including such obvious staples as milk and potato chips. Supermarkets import out of season fruits and vegetables, which ensure a constant supply while forcing laborers to work in stifling conditions for low wages, raising humanitarian and labor issues. Supermarkets are a staple of consumerist society. They bring mass quantities of food to as many people as possible. Markets have been around for centuries, but a supermarket, which imports food and has a constantly refilled supply of produce, is a unique change in human eating habits. No longer are families dependent upon which foods are in season, how good or bad the agriculture was that year, or finding their own food; it is all at one convenient location. Supermarkets are set up with colorful advertisements, large carts in order to transport large amounts of food with ease, and cashiers with self-service checkouts at the front of the stores. Often, supermarkets will run coupon and sales specials for customers. Many coupons and discounts are also available online to print out and bring to the supermarket. Supermarkets are a convenience for consumers due to their ease of navigation, their business hours, and numerous locations. Many supermarkets have made their stock available on the internet. Customers can select what they want on their computer, and it will be ready for them by the time they arrive at the supermarket. Some supermarkets even use this method for a delivery service, delivering the chosen groceries to the customer's doorstep. This is seen by some as the future of supermarket shopping, browsing digital produce in digital aisles without leaving the home. ↑ M. Zimmerman, “The Supermarket and the Changing Retail Structure,” Journal of Marketing, 1941. ↑ Mass Market Retailers, The Place Where Supermarketing Was Born, 2002. Retrieved June 16, 2007. ↑ About Retail, Supermarket, Arkay Cost Reduction, 2005. Retrieved June 22, 2007. ↑ Ryan Mathews, "1926–1936: Entrepreneurs and Enterprise; A Look at Industry Pioneers like King Kullen and J. Frank Grimes, and the Institution They Created (Special Report: Social Change and the Supermarket)," Progressive Grocer, 1996. ↑ 5.0 5.1 Thomas Reardon and Dave Weatherspoon, The Rise of Supermarkets in Africa, Development Policy Review, 2003, 21(3): 333–355. Retrieved June 22, 2007. ↑ Margaret Ntloedibe, The South African Market is Booming, AgExporter, April 2004. Retrieved June 22, 2007. ↑ Sarah Irving, Don't Believe the Hypermarket. New Internationalist 395 (November 2006). Retrieved June 16, 2007. ↑ Barbara Kahn and Leigh McAlister, Grocery Revolution: The New Focus on the Consumer (Prentice Hall, 1997 ISBN 0673998800). Reardon, Thomas, and Dave Weatherspoon. The Rise of Supermarkets in Africa. Development Policy Review, 2003, 21(3): 333–355. Retrieved June 28, 2007. All links retrieved October 28, 2015. Scrambling for customers – San Francisco Chronicle article on history of supermarkets. Regional Consolidation – Affiliations of American supermarket chains. Loblaws – Large Canadian superstore chain. Wal-Mart – The world's largest supermarket. Super Fresh – Supermarket in the northeast United States. Tesco – Britain's Tesco, one of the world's largest supermarkets. Aldi – One of Europe's largest supermarkets with origins in Germany. Carrefour – Another one of Europe's largest supermarkets, from France. Migros – Switzerland’s largest supermarket. Auchan – Supermarket in France. Pick 'n Pay – Supermarket in South Africa. Wellcome – Supermarket in China. This page was last modified on 28 October 2015, at 14:36.